With summer on the way, you’re probably looking forward to spending time outside with friends and family. Remember the days when you used to be the one hosting everyone for get-togethers on your deck? Maybe you don’t anymore because your deck is old and worn out. But that doesn’t necessarily mean that your deck has to look as if its best days are behind it. 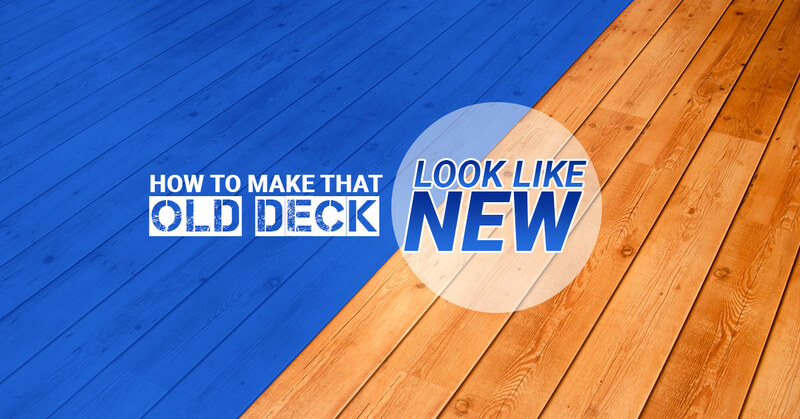 In this blog, our deck builder will explain how you can give your tired-looking deck a complete makeover in no time. Choose the right finish – It’s difficult to find a deck finish that takes care of aesthetics, practicality, and protection. For example, while you may find a clear finish that shows off the beauty of new wood, it may not be the choice for blocking ultraviolet rays. Today, semitransparent stains are the most popular deck finishes. They look great, contain more sun-blocking pigments than clear finishes, and require little attention. Wash – Next, you’ll want to wash leaves and dirt off the deck and railings. Feel free to use either a garden hose or pressure washer. If the job requires a more heavy-duty approach, consider holding the nozzle tip about 18 inches from the wood for maximum efficiency. Scrub – Once you’ve washed the deck, it’s time to scrub it. It’s recommended that you dip a brush with stiff, chemical-resistant bristles into the cleaning solution and scrub the wood in the direction of the grain. For best results, work in small sections, starting with the top rail. Power rinse – Give the soap at least 15 minutes to work its magic before proceeding to this step. Then rinse off the solution completely using a garden hose or pressure washer. Do so as steadily as you can, rinsing one board at a time. Let dry – Before applying the stain, allow up to four consecutive days without rain so that the wood dries. In the meantime, you can sweep the deck clean. Stain the railings – As you use a synthetic filament brush slightly wider than the deck’s boards, apply the stain beginning with the top railings. Stir the stain frequently during application for an even color. You will see the best results if you finish all four sides of each baluster prior to moving to the next one. Are you looking for a new deck altogether? With Ready Decks, customers receive the most affordable decks that are not only beautiful, but guaranteed to last. As you can see here, our deck installer uses the best materials, such as premium-grade, treated lumber. Customers are also treated to our innovative, patent-pending building system, something that other decking companies can’t claim. You can also feel at ease knowing that every deck installed by our deck contractors is backed by a lifetime limited warranty. Get back to hosting summer parties thanks to a beautiful new deck. Contact us today and be sure to check out the Ready Decks advantage.